At club cricket level there are many batsmen who have a whole career with just 2 or 3 shots they play well. How much better could you be if you added another strong shot to the list? Anyone can try and add a shot, but doing it right takes a certain amount of work in practice. You can't learn it in games. The amount of time in practice will vary depending on the individual's ability to learn, but everyone can make progress. There is a distinct process to doing this that works well with younger players and can be adapted to any age. This is called chaining (or reverse chaining) and works best when you can work with a coach on a one to one basis. If you don't have a coach you can still get a willing team mate to help you. Before you even pick up a bat you (or your coach) need to know the basic technique of the shot. For most shots an excellent resource is Gary Palmer's book that breaks down each shot into its key coaching points. There is no need to over analyse each movement at this point. All shots have a lot of coaching points to remember and you probably do most of them naturally. Just try to get an idea of how the shot is supposed to look and where you are trying to hit the ball. The next step is to play the shot from a stable position. In these early movements use a tennis ball bobble fed to you slowly from a short distance away (for drives you could even have a drop feed). This will groove the feeling of hitting the ball in the right place. It's common to make a lot of mistakes at this point while you get the feel right. Keep hitting a lot of balls to find your own way of doing this. If you have a coach or observant team mate, get feedback from them if it is not going according to plan. However, make sure you only work on one technical aspect at a time to avoid over analysis. One you are confidently hitting balls into the right place you can add the initial movement back in. So for our sweep shot example you would start the shot from your normal stance, moving through the backswing and step, into position and shot execution. Stick with tennis balls and bobble/drop feeds until you are repeatedly hitting the balls in the right place. Then increase the pace of the feed and move onto cricket balls from a thrown feed. Again, technical issues can be corrected here by a coach. As before, the result is more important than the method and coaching should be kept to a minimum unless you are really struggling with one aspect or another. At a pinch you could move straight to the nets from this point with your new shot. This is up to the individual. If time and resources allow I would strongly recommend completing at least the next step before moving to the nets. The ideal at this point is to have a bowling machine available to be able to bowl the ball in exactly the right place every time so you can practice your shot with a bowler. Most people will not have easy access to this so an alternative is someone who can throw a cricket ball on the right line and length from 15 yards or so away. It helps to mark the right area with chalk. If you are still making technical errors, move back to step 3 and groove your technique further before moving back to the bowling machine/full speed feed. Make your feeder mix up deliveries so every now and again you have to play a different shot. This will make you think before executing the shot. Mark out different scoring areas for your shot with coloured markers. Get the feeder to call out what area to hit the ball as they feed it to you. When you are able to do this regularly, you start selecting where to hit it instead. Now you are ready to show your shot to the world in a normal net session. You should be totally confident to your execution so when the right ball comes along in the nets you simply let your muscle memory take over and hit the ball where you want. If this is not happening, go back to steps 3 and 4 until you feel confident again. he pressure now becomes much greater so the chance of you making a mistake also ramps up. At this point you know you can play the shot, it's now a mental thing. Can you play it in the heat of battle? If you can't I would suggest it's time to think about your mental approach rather than technical errors. If you can play the new shot in a match, congratulations! 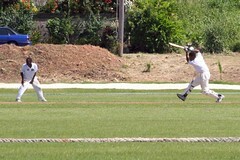 For the initial work in grooving muscle memory you could also use a batting tee for such shots as drives and the pull. Would allow total concentration on the shot without worrying about the path of the ball. Then progress on to a drop ball or bobble feed as suggested. Yep, that's an excellent progression if you are really struggling at the outset. Number 2 will give you a helping hand, but the key is number 1. Both is ideal. However, if you can't do 2, you have to do 1. If you can't do 1, there's nothing I can do to help you. I have been a regular visitor of this site. There are a lot of valid points about playing crickets that you share. Totally loved your article on adding new shots to one’ personal style. The tips were literally worth reading. Please keep sharing. Thanks.